Thank you for your interest in the All-Outdoors Professional Whitewater Guide School. Our school is geared toward individuals who want to be a whitewater river guide. We're certain you have a lot of questions regarding our program. We hope this page will answer most of those questions. Taking a whitewater guide school is a life-changing experience. You will forge strong relationships with both your peers and instructors, learn valuable life skills, and explore your own talents and challenges. It is an excellent experience whether you are old, young, outdoorsy or a city slicker. Once you learn the language of the river, you will scarcely be the same. An "Enrollment Questionnaire" is required for admission to our Professional Guide School . You may view/download a printable PDF version of the Guide School Questionnaire by clicking here. In addition to these proficiencies, you will hone your public speaking skills, your team-building abilities and your problem-solving skills. You will also learn the specifics of how All-Outdoors runs trips on the South Fork of the American and have the opportunity to be invited to our post-school training program (see "Does All-Outdoors Offer Training Opportunities After Graduation?" for more information). Each day is spent on the river. 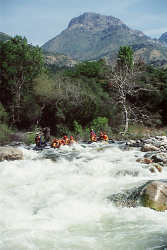 Negotiating the South Fork takes definite skill but is not so difficult as to be an unmanageable for beginning guides. Our days will start early and end late. The nights are spent at our established riverside car-access camp. Every night we will cook our own meals and we will sleep under a canopy of stars. Days are long and rigorous, but full of camaraderie and laughter. You will have three to five instructors, depending on enrollment numbers. Your instructors will range in age and experience but all of them have been guiding for at least five years and many have over ten years of commercial guiding experience. Our one-week guide school enrollment fee is $795. This includes all meals. It also includes the possibility of being invited to our post-school training program (see below for more information). You are responsible for providing a wetsuit (AO can rent you one) and personal camping gear. Am I guaranteed work with All-Outdoors after I graduate? All-Outdoors does not guarantee employment within our company upon completion of its whitewater school. That being said, we do prefer to hire from our own pool of graduates. However, our employment needs change every year and sometimes competition for these positions becomes fierce. When not hired by All-Outdoors, many of our guide school graduates have procured employment with other rafting companies within California and throughout the western United States. Does All-Outdoors offer training opportunities after guide school? After you graduate, your abilities as a guide will be evaluated by your instructors. Depending on your skills, work ethic and attitude during the guide school, you may be asked to participate in our post-school training program. This is in many ways the fast track to start guiding with All-Outdoors. This program consists of guiding trips in a student training boat and observing in a veteran-guided boat with paid customers. After you and your supervising instructors deem you ready, you will do your "check-off trip": guiding a boat of paid customers down the South Fork while one of your instructors evaluates your performance. After successfully completing your check-off trip, you are cleared for work. But with All-Outdoors, the training opportunities don't stop there. We like to think of your entire first year of guiding as training-in-progress. Several times throughout the season you will have the opportunity to ride-along in a veteran-guided boat and go on specially scheduled training trips on other, more difficult, rivers. All-Outdoors also offers "learning incentives" on its pay scale. Your guiding wage can be radically changed just by reading and writing a small report on Cadillac Desert ($10/trip bonus!–when have you ever gotten a ten dollar raise in your first few months of employment?) or by obtaining a Class B driver's license. All-Outdoors also pays you back for obtaining certifications above your CPR/First Aid certification (Swiftwater Rescue, Wilderness First Responder). Everyone at All-Outdoors knows learning to guide is a lifelong process– our guides and our staff are committed to helping you in all your whitewater learning endeavors. Some final notes: If you intend on pursuing employment with All-Outdoors after your graduation, we suggest that you obtain certification in first aid and CPR prior to your course. Both of these certifications are required in order to guide professionally in California (and nearly everywhere else). Also, due to the physical demands of guide school, we ask that you be in good physical and mental condition prior to your enrollment. Remember, we will not contact you until you have returned a completed questionnaire. All-Outdoors is a family-owned and operated company. 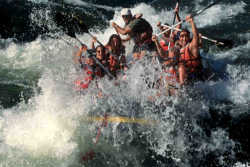 The Armstrong family has been providing rafting trips for over 50 years. We have grown to become one of the largest outfitters in California, having permits on 10 of the State's best whitewater rivers. Although we are a large company, we strive to maintain an atmosphere of care and concern for our guides and guests. We want our guides to enjoy their work. We want to provide professional, well-run trips for our clients while maintaining the family atmosphere that marked the beginning of All-Outdoors. All-Outdoors hires guides from a wide variety of backgrounds. The age of our guides range from 18 to 60 years old. Most of them either have college degrees or are presently attending college. Our staff consists of about 150 guides. One third are full-time and the rest are part-time. During the off-season, our full-time guides hold various occupations, such as college professors and students, schoolteachers, and outdoor specialists. Most of our seasonal part-time guides were once full-time guides who have moved on to other careers but now guide on weekends. Their occupations range from careers in law, dentistry, business, computer programming, medicine, education, fire fighting, engineering, building trades and law enforcement. The diverse professional backgrounds of our guides allow them to interact well with our clients who are from similar disciplines. Having this connection with our guests enables All-Outdoors to respond quickly to the changing needs of our clientele and produces a higher standard of service. The most important component to the All-Outdoors rafting program is our guides. It is for this reason we maintain stringent hiring standards. The characteristics that we look for in our staff are: solid communication and inter-personal skills, common sense and clear thinking in emergency situations, and respect for fellow guides and our guests. Through our efforts as a company and the permits granted by the government, we are able to provide the public with a unique opportunity to enjoy their natural resources. Ultimately, it is our guides that allow us to do this by using their skills to safely and professionally execute our river trips. 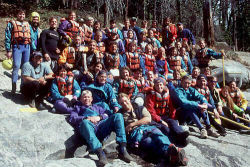 Thanks again for your interest in the All-Outdoors whitewater rafting guide school. Please do not hesitate to contact us if you have any questions.